The comprehensive resource for your training needs. Research shows training isn’t just an expense — it’s a proven investment to engage and retain employees, increase efficiencies and enhance member-focused service. 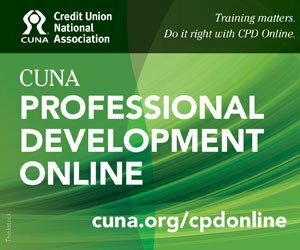 Choose CPD Online for your online training and discover the difference it can make for your credit unions and their bottom line. Visit cuna.org/cpdonline to learn more.